I’ll admit I have a soft spot for themed family restaurants. That may be why I love almost every restaurant in Disney World. I also luck out by having New York City and Philadelphia so close by that they also have quite a few of these, Gump & Co, and the Jekyll & Hyde Club are just a couple I can think of. I’m no foodie but as long as the atmosphere is fun, service good and the food at least edible I’ll give the place a chance. 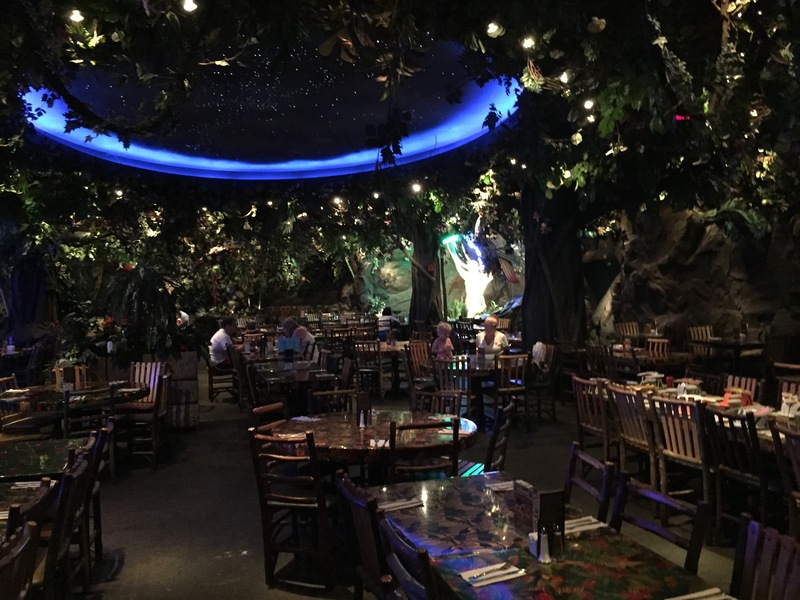 Once of my all time favorites is the Rainforest Cafe chain. I remember the first time visiting one of these as a teenager and just being blown away, and I think that initial experience stuck with me that I keep going back whenever I can. We used to have quite a few of these nearby but over the years they have been slowly closing up. There is one in Atlantic City that I visited earlier this year and posted about, but this time I visited the only other location in Jersey which is located at the Menlo Park Mall in Edison. The fun begins as soon as you walk up to the restaurant. 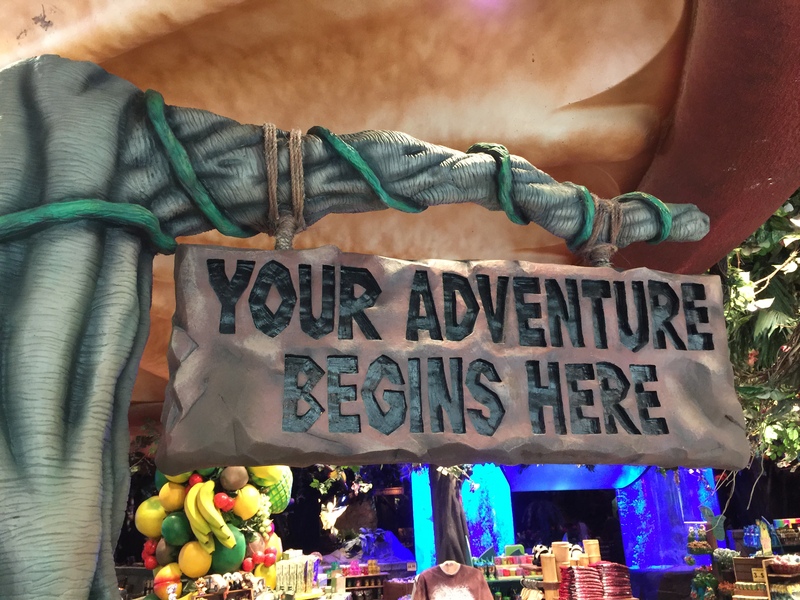 Even if you There is front desk to check in and “Start you adventure”, and in the event you need to wait for your table, not to worry there is a nice big gift store filled with all sorts of things your kids will beg you for. Right next to the gift shop is a very nice bar with all sorts of Rainforest-y inspired drinks both alcoholic and non. 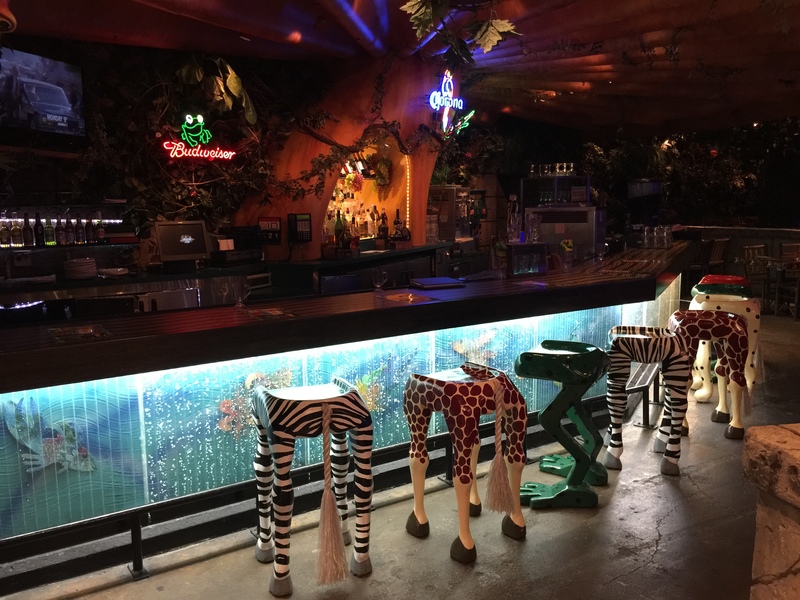 The animal themes even continue in here, I mean who wouldn’t want to sit on one of those chairs. Not much lumbar support but you should be leaning forward enjoying your drink anyways so no biggie. We eventually made it to our table in the middle of the jungle and Hanna was immediately given a special Cha-Cha piece of headwear to put on. 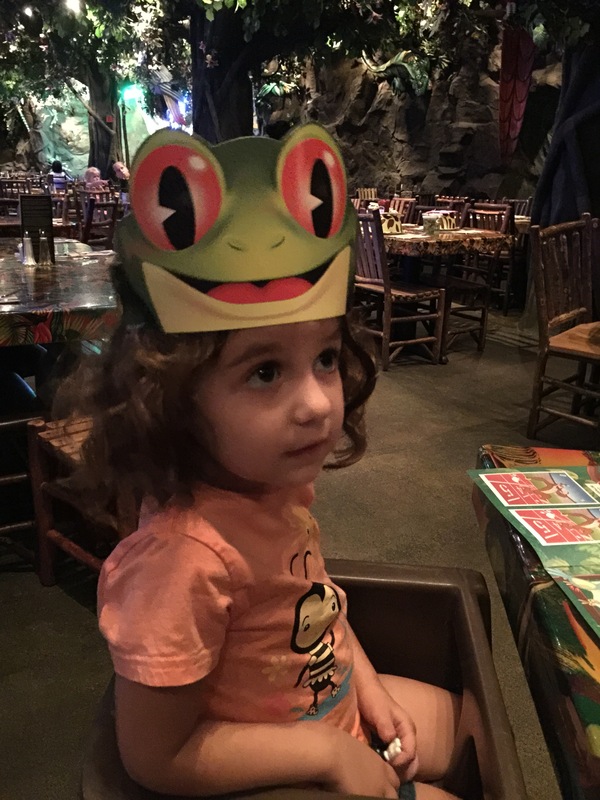 Cha-Cha is one of the Rainforest Cafe mascots and I believe is some type of tree frog. As you wait for your food there is a lot of things to look at. Luckily when we went it was early so there weren’t too many people there and we were able to wander around without intruding on anyone’s lunch. 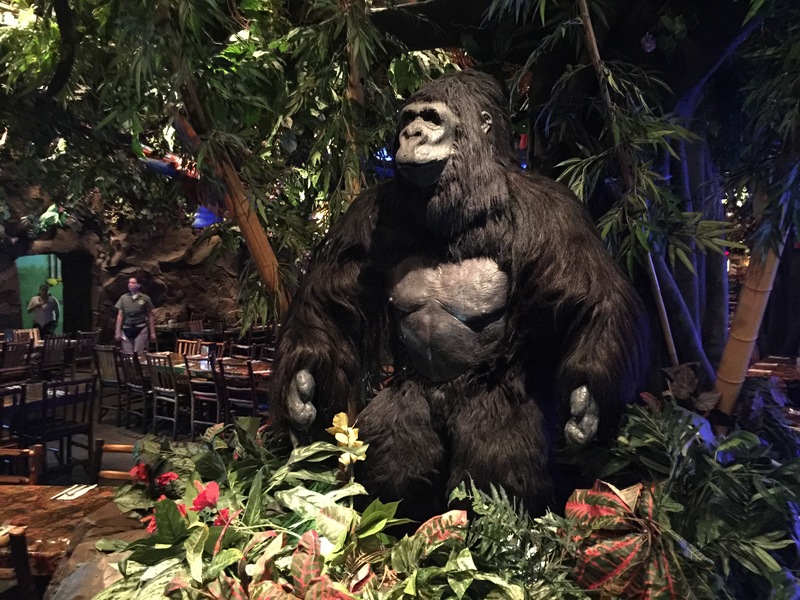 There are some animatronic Elephants, Butterflies, and even some Gorillas that come to life periodically and keep things interesting. Every 30 minutes or so there is even a thunderstorm that really gets the animals riled up. Lunch eventually showed up and everyone enjoyed their entrée. When we were done Hanna asked for one last tour around to say goodbye to all the animals. Then we headed back out to the gift shop area. 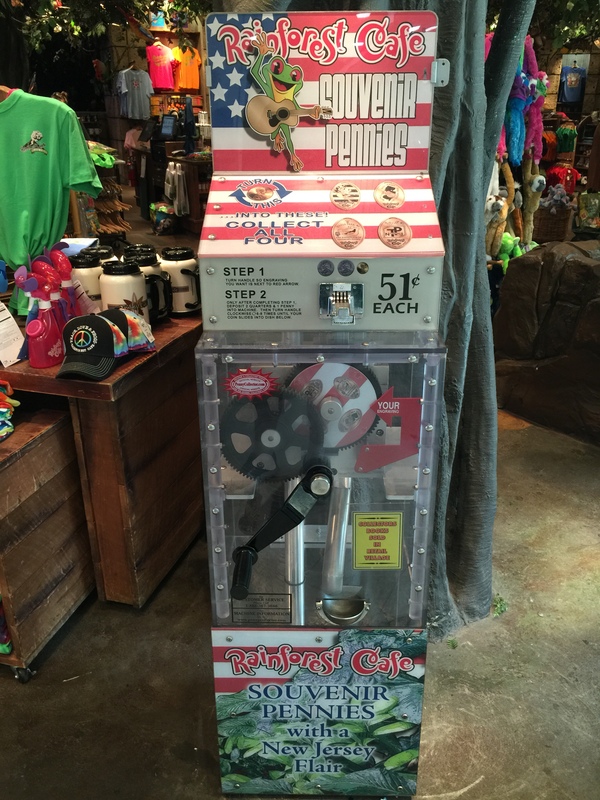 Just like every other Rainforest Cafe location I have ever visited they have a penny machine. One really cool thing about their machines are that the designs always includes the location of the restaurant. 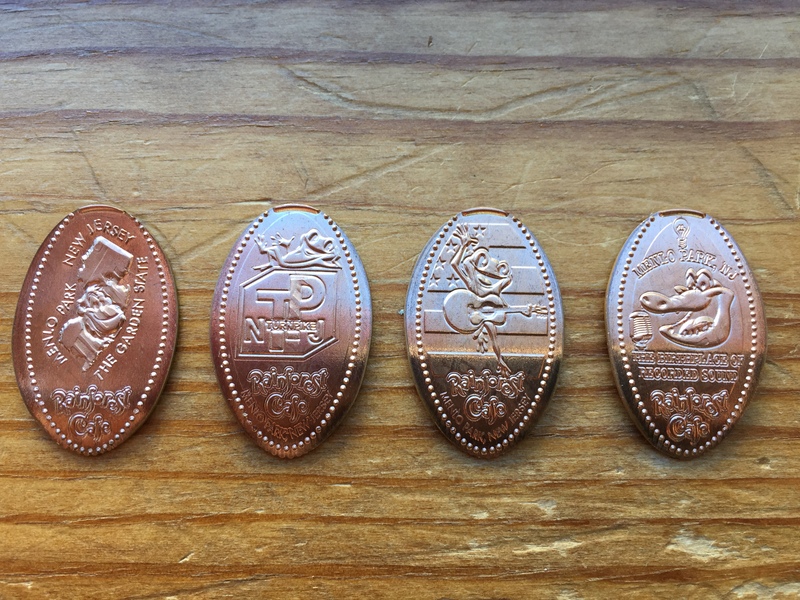 This makes a cool subset of coins that can be collected as you check out all their different locations across the country. Plus they take up a lot less room than the souvenir glasses they always try to get you to buy. The machine worked really smoothly and pressed the designs nicely. There were some children nearby that immediately ran over when I started using the machine. They wanted to asked questions and I walked them through what the machine was doing and showed them the final products. They seemed impressed and ran off no doubt to ask their parents for some extra change. The designs include: Bamba the Gorilla, NJ Turnpike, Cha-Cha the Frog, and Nile the Crocodile. 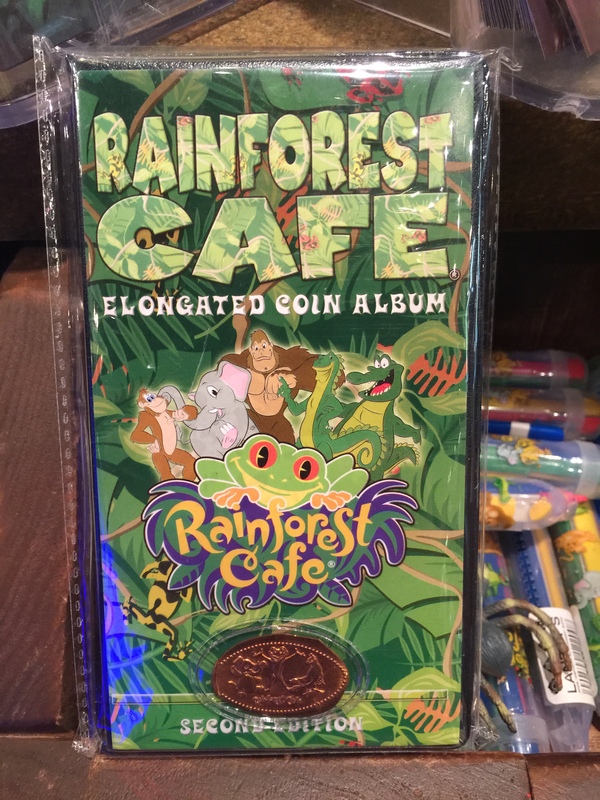 You can also get Rainforest Cafe penny booklets in the gift shop. This location only had the Second Edition available, but I have seen the First Edition available from time to time you just have to keep looking. 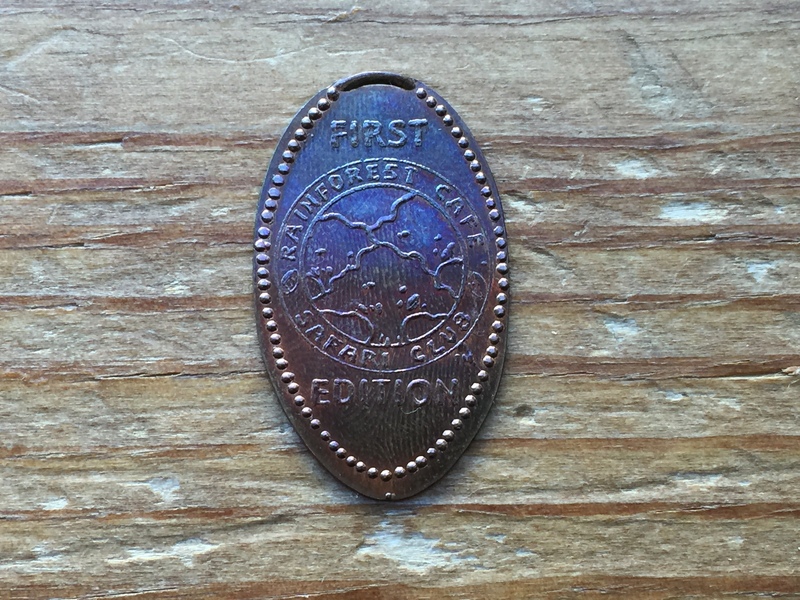 Here’s a close up of the special penny available on the Second Edition booklet. 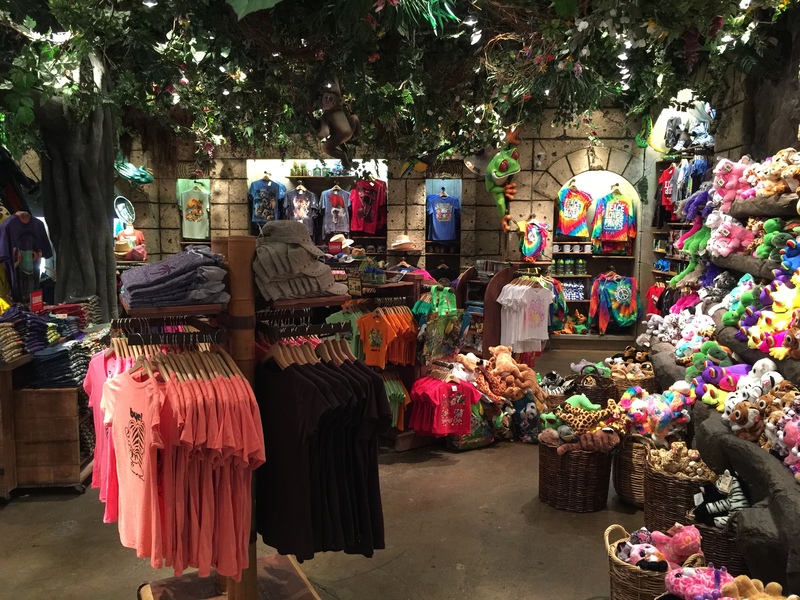 It has three of the Rainforest Cafe characters: Tuki the Elephant, Cha-Cha the Tree Frog, and Rio the Macaw. Here’s a little secret. I can’t guarantee this is even still available but a few years ago when I visited this location to use the penny machine I also bought the penny booklet. While at the register paying for the booklet the cashier asked if I collected pressed pennies. I told her I did and she pulled out a bag from under the counter and offered me a special gift. 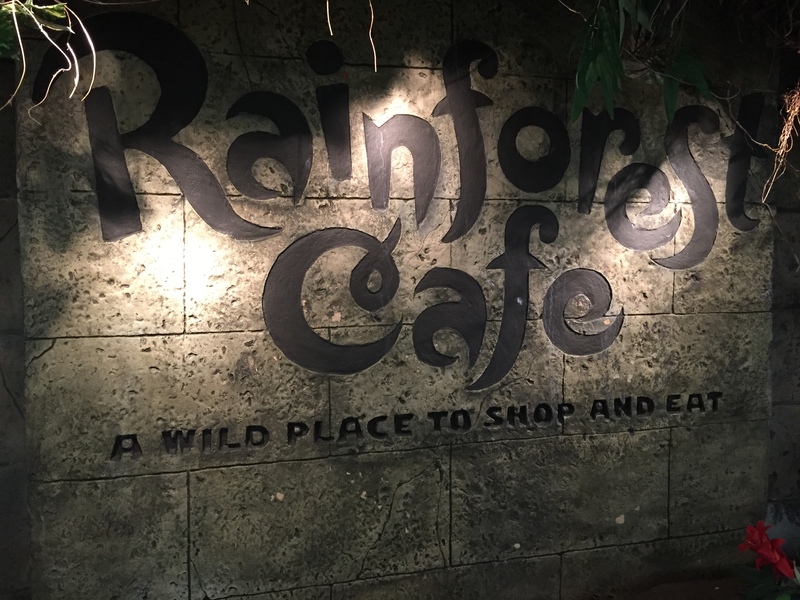 The Rainforest Cafe used to have a Safari Club that you could join and accumulate points with each meal that would be used to pay for future appetizers and other things. 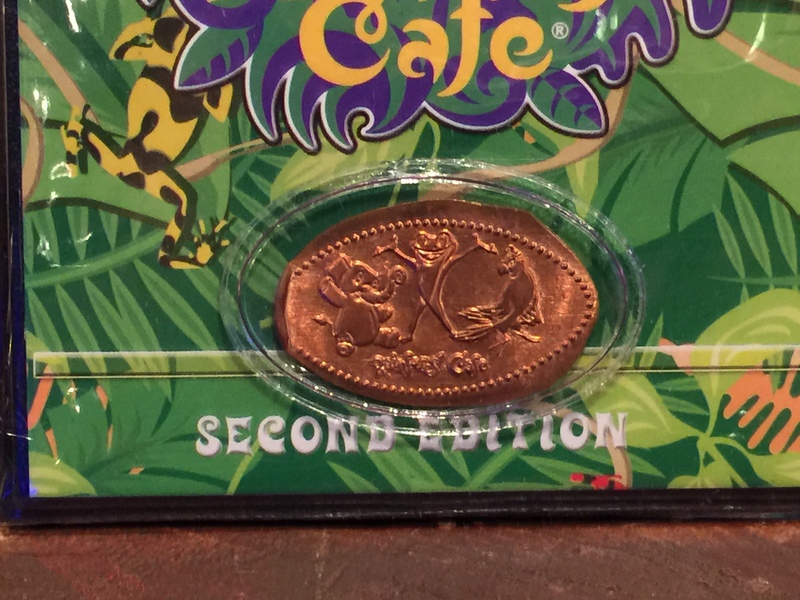 This was a special pressed penny they would give to anyone that signed up for the Safari Club. The cashier didn’t make me sign up for the club (although I probably would have if needed to get the coin), I was truly grateful to her for offering this to me. I have talked with other collects and not many people seemed to know about this coin. I still don’t know if all their locations offered this at some point, or if you can even still get it. I have asked from time to time hoping to try and get another one, but I always get a confused look from the employee so I think this may not be available anymore. But it doesn’t hurt to ask, and don’t be afraid to tell people you collect pressed coins, you never know who may have a special one to give out. You’ll never know unless you ask.